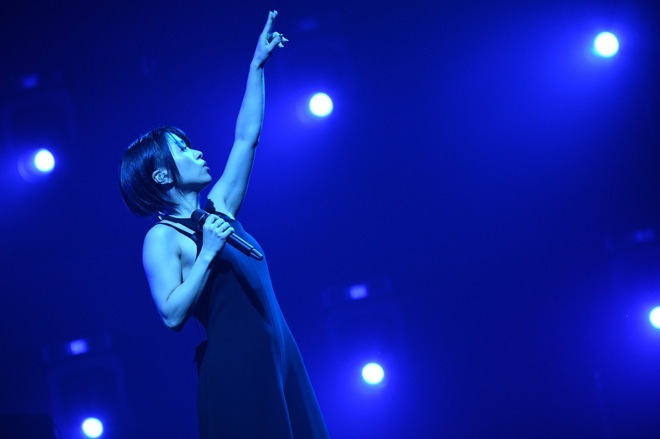 Singer Utada Hikaru has finally kicked off her very first Japanese tour in 12 years! Her last being “Utada United 2006”. The first date of the “Laughter In The Dark” tour took place at the Yokohama Arena. During the first MC Utada thanked all the fans coming, despite the bad weather! She couldn’t believe that it had been 8 years since her last live concert (“WILD LIFE”, in December 2010). “Laughter In The Dark” will have 12 shows in total, concluding on December 9th. This will mark her 20 years in the music industry, her debut single “Automatic / time will tell” was released on December 9th, 1998. In celebration of the new tour Utada released a brand new remix of “Too Proud”, a track from her latest album “Hatsukoi”. It features the rappers XZT, Suboi, and EK.